There's just something about a pig asking if you've been CURED yet that tickles my funny bone...and I needed a funny (punny) card for a pre-teen boy who's facing some serious health issues. I used MFT's "The Whole Herd" for the sentiment and "Hog Heaven" for the pig and fence. To carry the cuteness further, I did a flip side for when he opens the card. It wasn't until after I had the card photographed that I realized Mr. Pig needed something to stand on. I already had the trough from "The Whole Herd" stamped and die cut, so I colored it in grays, turned it over, and mounted it with foam tape for some dimension. I didn't photograph it because I'd already written something in the card and wanted to protect the young man's name. It wasn't my intention to create a framed for the inside of the card. I usually do top-folding cards so they photograph well. I made the card and then realized my cute little backside flipped upside down(Doh!!) which ruined the effect. MFT's stitched dies to the rescue. I cut out the top of the card, cut and folded a new cardbase, die cut the center out of the left inside panel, and then mounted the pig imaged panel with foam tape. There's almost always a way to rectify a mess up. The "You Got This" sentiment is from a CTMH disaster relief set that retires after TODAY. 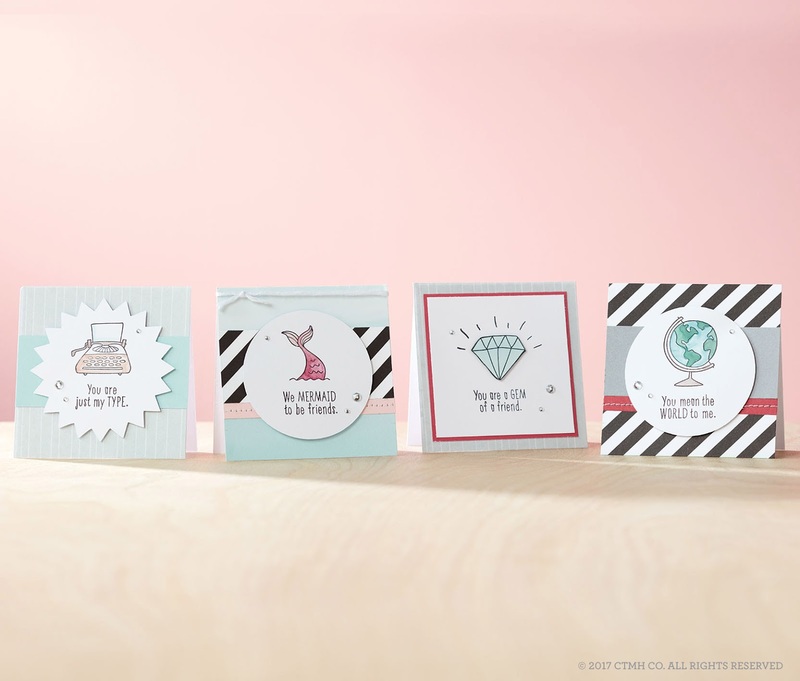 Here's a link to a post with a full picture of the stamp set including a shopping link. I started by stamping "GOT THIS" with my MISTI and, because it was a previously unused stamp, stamped it twice for full coverage...only my card slipped out of place and I didn't realize it until after I stamped. I decided to make it look like I planned it that way by coloring where the two images overlapped (see...you can even rectify two mess ups!). 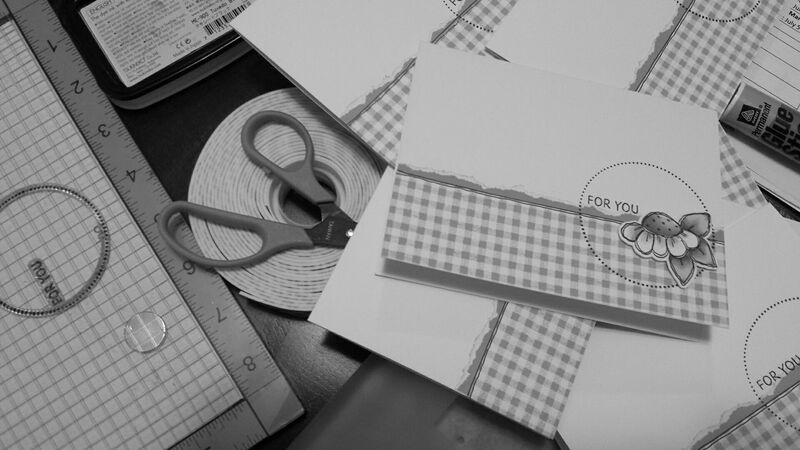 I then stamped the "you" twice, making sure it was stamped in the right place. Off to work on edits for my friend. Her novel is due tomorrow and then she has to jump into another deadline. And I thought my deadlines were bad this year. She makes me look like an amateur! Movers come in less than a week. I have a hundred things to do between now and then--not the least of which is helping my friend with edits on her latest novel--yet I was obsessed with making this new Christmas decoration...probably because I'm moving in a week and my after Thanksgiving tradition of decking the house is a waste of effort. I used up a bunch of retired CTMH paper and supplies though, so I'm counting that as getting ready to move. I used my Cricut to cut each letter and the "Joyeux" five times, once with the colored paper and four times from off-white cardstock. I used Arial for NOEL and Adlery for Joyeux. Much patience was required to glue the layers together but it needed the stability. After each letter of NOEL was assembled, I sponged the edges in coordinating ink colors. I laid everything out on my kitchen table and fussed with embellishments until I was happy before gluing anything down. I used Liquid Glass to connect my letters and adhere almost all the embellishments and on top of the holly berries for added shine. I used the Artbooking CTMH Cricut cartridge for the reindeer and mail stamp; the tags on the L as well as the holly leaves and berries come from Art Philosophy. Now I really do need to clean up the craft room and get ready for the movers. Close to My Heart is holding a one-day flash sale to celebrate Cyber Monday! 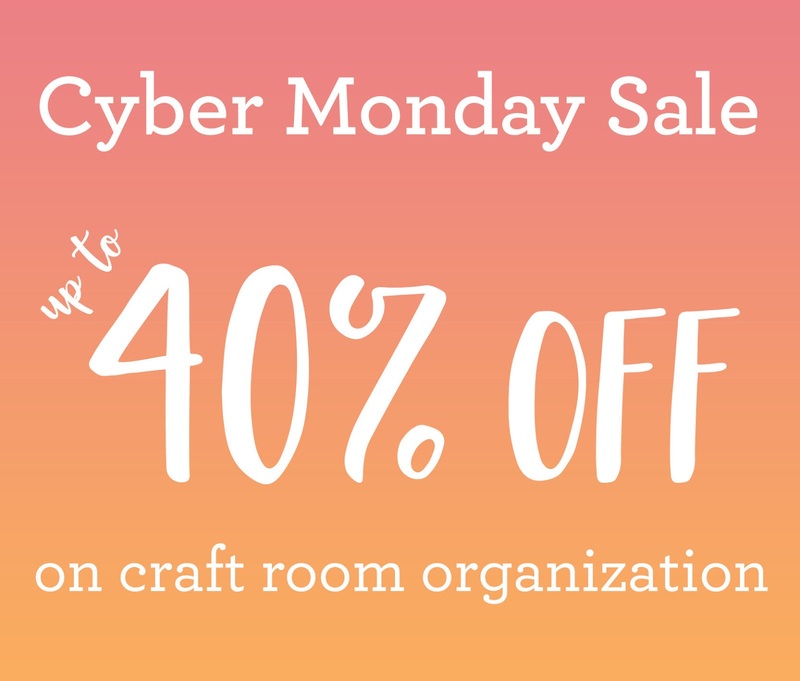 The sale will give you a chance to get a 30% discount on individual Workspace Wonder™ items and a 40% discount on select bundles of Workspace Wonder items! This sale starts November 27, 2017 at midnight (MST) and will end 11:59 pm on that same day. Sale prices are only available on orders placed through MY WEBSITE during these times. All discounted items ordered as part of this sale count towards the Stamp of the Month and Hostess Rewards qualifying order totals. To see which items will be discounted during this sale, visit the Promotions Page on my website at any time during the sale times. All the items included in the sale are only available while supplies last, and there is no grace period for placing orders—so be sure to orders before the sale ends! 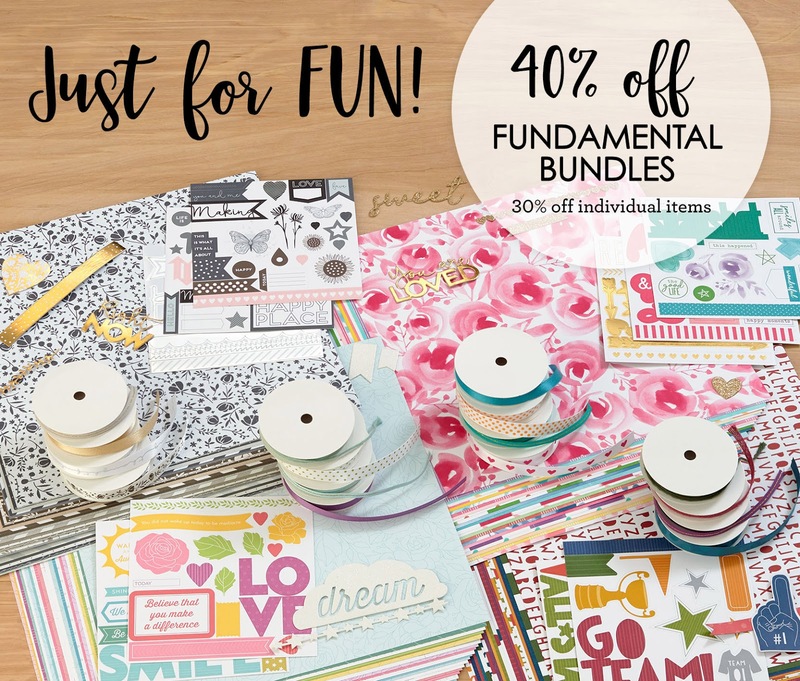 And don't forget about the Just for FUN promotion with 40% off Fundamental bundles plus 30% off individual Fundamental products (while supplies last...and some are already gone). Finally, if you want the special Stronger Together stamp set, order before the end of November. All profits from this set go to aid disaster relief efforts. 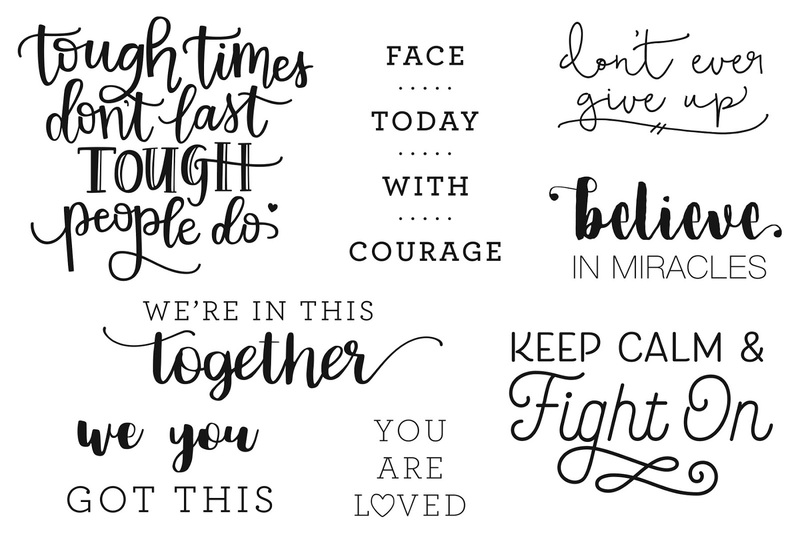 It's been enormously popular because, as you can see, the sentiments are fabulous for all sorts of occasions requiring an encouraging word. My website accepts all major credit cards (except American Express), and orders will ship directly to you. 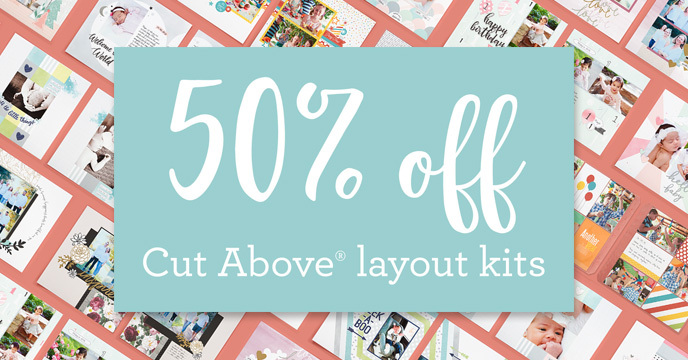 Click HERE to save 50% on CTMH's innovative Cut Above® layout kits! Each kit includes beautifully-designed preprinted pages, stickers, die-cut paper pieces, and Memory Protectors™, so all you need is your favorite adhesive, a journaling pen, and your photos! These kits truly make scrapbooking faster, simpler, and easier than ever! For even more savings, you’ll get 30% off your choice of My Legacy™ album when you purchase one of our The Story Begins layout kits! Don’t let this savings opportunity pass you by — get these time-saving memory keeping items today and start preserving your memories! This week at Heart2Heart we are highlighting projects using Close to my Heart's color of the year: Bashful. I'm deeply in love with this color. Truly, madly, and deeply. I couldn't stop at just one project so I did two, both utilizing the direct to paper technique. As always, products available for purchase are in italics with built in links for your shopping convenience. For the first card, I began by creating a frame using two MFT stitched dies. Next, I ran Bashful paper through the Rose embossing folder and applied Bashful ink by carefully running the pad over top of the raised portions to highlight the pattern. I kept my ink pad flat and used a gentle hand. Once the ink dried, I cut the "B" out of the center using the Block Alphabet-Thin Cuts set. I backed it with very, very old gold paper with a butterfly pattern, positioning the paper behind the "B" so some of the pattern showed through. I glued the Bashful paper straight to my card base then mounted the frame over top of it with 3-D Foam Tape. The final touch was cutting out the baby's name from the birth announcement, cutting a V into each end, and attaching it to the card with glue on the ends and foam tape in the center. On this card, I started by swiping Bashful ink over patterned paper from the Basic Fundamentals paper packet (on sale this month!) I kept swiping until I achieved full coverage. It's a little difficult to judge since the ink won't apply evenly. You have to let it soak in and dry some to make an accurate assessment. The paper will curl on you a bit, but it's not a problem. Just place it under a catalog or magazine when it's almost dry and let it sit overnight. For the background, I started with another die cut from MFT. I love the extra frill the scalloped border gives this card. Next I added another piece of Bashful paper, this one run through the Buffalo Plaid embossing folder. You might recognize the stitched rectangle behind the elephant. It's the center piece from the first card. The MFT die set I used is stitched on both the inside and outside of the cut which makes it doubly useful. I stamped the elephant from the Sweet Baby set onto my altered Basic Fundamental paper in Black ink, then stamped just the tail again on the base of the white stitched background. I cut the elephant using the matching die cut, but I didn't like the border. A plain border would have been fine, but the pattern outside the lines of the elephant was too distracting for my taste. Micro-tip Scissors to the rescue. I trimmed close to the line, cutting off the tail completely, then ran a black marker along the edges so no white showed. After gluing the elephant down, I added some shading with markers and then some sparkle with a Shimmer Brush. 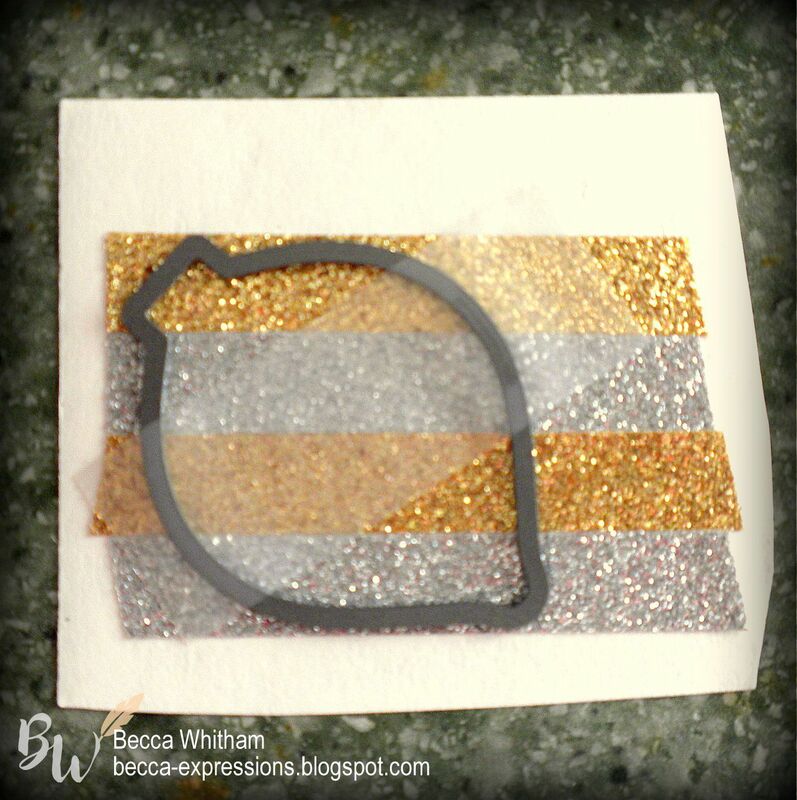 I stamped the circle "Sweet" in Charcoal ink, added "Baby" from the Baby Animals stamp set in Black ink over the top, cut it out with a circle die, and added it to the card. Finally, I accented with retired Dreamin' Big sequins and Bitty Sparkles. Please come join us at Heart2Heart this week. We love seeing everyone's creativity! The hardest part of this card was coloring Little St. Nick (NOTE: links to purchase available supplies provided for your shopping convenience). I stamped him in Momento Black Ink and colored him with a combination of markers and colored pencils while watching football. Cutting him out was a breeze using my new Brother ScanNcut CM350. I'm crazy in love with this machine. It cut a full page of Santa faces in about two minutes. TWO MINUTES!! With both stamps mounted on my MISTI, I assembly-line stamped the background and sentiment using Pebble ink (splotch) and Charcoal ink (sentiment). I could ink both, press them down, then shift my card so the one with the splotch next got the sentiment, and away I went. When the bases were stamped, I used Foam Tape to add Little St. Nick and DONE! Little St. Nick and Ho Ho Ho are both mini stamps, meaning they are only $2.95. That's a sweet deal!! Off to print out my Christmas letter, print out my labels, and be ready to stuff, lick, and stick my cards while watching football this afternoon. My writing partner for The Promise Bride (Montana Brides Series) is sitting in the hospital today awaiting her husband's heart surgery. I need to send a get well card, but I wanted it to be masculine. Oddly enough, one of my favorite floral sets came to the rescue: Bamboo Roses by Altenew. I decided to use their November Challenge colors while I was at it. I began by clear embossing the sentiment and a vine from Bamboo Roses onto water color paper. I then added water and painted, flicked, and dotted with Tim Holtz distress ink in Wild Honey, Vintage Photo, and Barn Red (which blended down into that burnt orange color). After it was dry, I wiped of any dots of color over the embossed sentiment, ran it through a rectangular stitched die from My Favorite Things, and mounted it to a Kraft card base. I love how this turned out. Praying the surgery turns out just as nicely! It's approaching time to move again. Hubby's class is coming to an end so we're off to a new "permanent" duty station. I love how the army thinks 2-3 years is considered permanent...or maybe I just laugh at it. Anyway, moving always prompts me to look at what I'm taking and what needs to go. I have a few scrap pieces of paper that I didn't want to throw out, so I made a couple general cards using a combination of old and current CTMH supplies. Current supplies are in italics and link to my consultant website for your shopping convenience. Once the base layers were down, I added the frame, die cut "hello" sentiment (which I hope CTMH brings back because I LOVE it!! See next card. ), and the thin banner "sunshine" sentiment from the Falling for You-Scrapbooking set stamped in Charcoal ink (my new favorite!). I accessorized with Bashful Pearls and retired Dreamin' Big Sequins. I knew I would be using that sequins a lot, so I stocked up before it retired this summer. I like using both the positive and negative space of die cuts. It's easy to get two-for-one if you just do a smidge of preplanning. All I did for this was to leave myself plenty of room along the edges of the Charcoal paper when I ran "hello" through my die-cutting machine. I then cut it into a banner and highlighted both the banner edges and the sentiment with a white gel pen. I used the same "sunshine" sentiment and Dreamin' Big sequins as the first card, but my background paper is from the current Cats and Bats patterned paper pack. This paper retires soon, so grab it while you still can. Off to the writing office. I've taken a nice, long break to do some traveling while my parents were here and to refresh my spirit after three deadlines on top of a move from Alaska to South Carolina. However, another deadline is approaching so it's time to buckle down. Hubby is studying for a major exam on Tuesday, so it's not like we get to do much this Veteran's Day Weekend anyway. Our challenge over at Heart2Heart this week is "Enchantment Abounds." I chose to use colors from the Enchantment color palate plus one neutral brown for a sympathy card. As always, links to the products used are embedded into the description for your shopping convenience. I began with Colonial White cardstock which is retired (but I have a TON of). White would work just as well. Using the Artbooking Cricut cartridge, I cut the circle background overlay and tag. I later trimmed off part of the tag which is why you won't find the exact shape on the cartridge. The card base is 4.25, the circle overlay is 4" H, the center square is 3x3, and the tag is 1.4" W.
I stamped a sentiment from Heartfelt Thoughts in Ruby on the tag, selectively stamping parts of the image in order to get two lines of text. After I had my sentiment stamped, I cut down the tag using a paper trimmer. Before gluing down the 3x3 square and tag, I used Sponge Daubers to brush Saffron ink on the edges. I glued everything down except the top flower which was added with Foam Tape for some dimension. Because the card is square, I was able to extend one of the leaves over the edge for more interest and it will still fit in a standard A2 envelope. The final touch was three Gold Glitter Gems. All month Close to My Heart is running an amazing special on Enchantment and the rest of the Fundamentals products. Seriously...it's incredible! Click here for a full description, and here for a full description of all the specials running this month, including the Stamp of the Month which you won't want to miss. I am (unfortunately) off to make several more of this same sympathy card. They say death comes in threes, and it's true in my case. I'll probably make a few extra to have on hand. Before I go, here are a few picture of Biltmore House in Asheville, North Carolina. I was able to tour this gorgeous mansion and part of the 8,000 acres on last Friday. 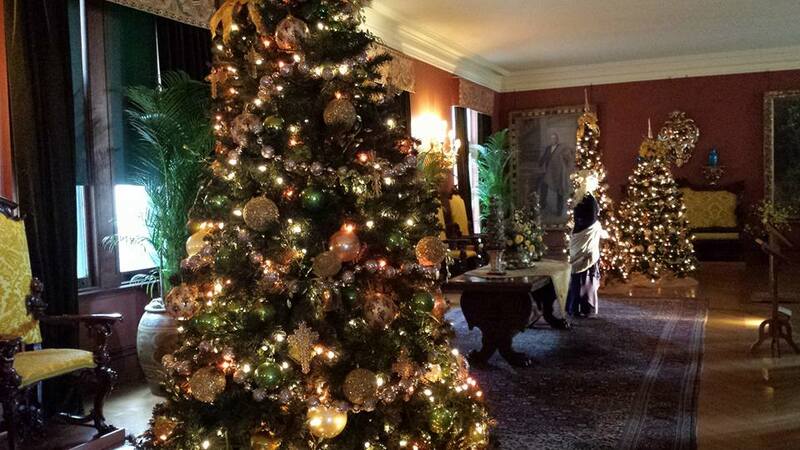 The house was decorated for Christmas while the leaves were putting on a full display of Fall glory. 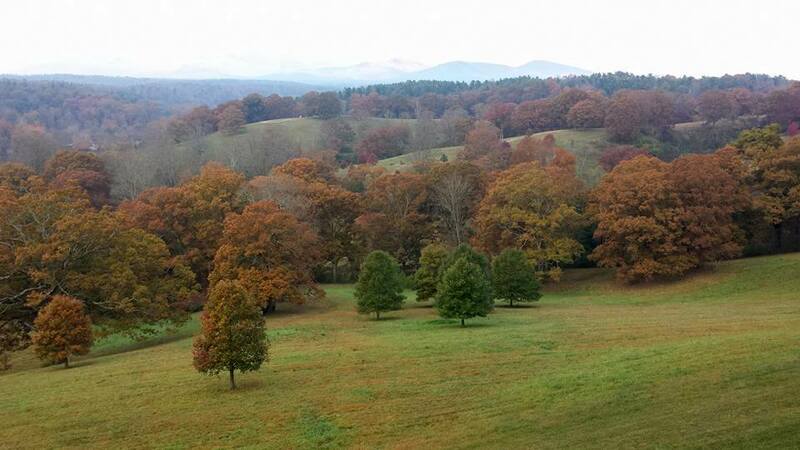 I'm off to North Carolina today to spend the night so I can get an early start touring Biltmore House. If you follow me on FB, you might see a B&W from there...but I'm not explaining. Close to My Heart's November specials are not to be missed. First is the Fundamentals bundles. 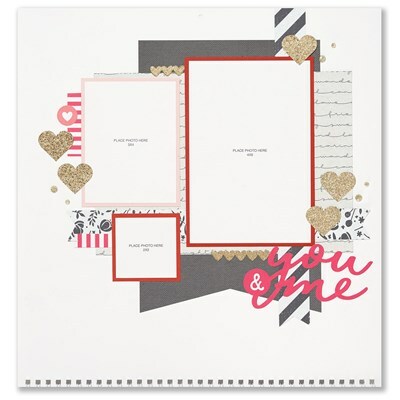 Each bundle features a paper pack of twenty-four patterned papers, the coordinating stickers, and a four-pack of coordinating ribbon. Purchased as a bundle, you get 40% off the normal purchase price, but you also can purchase individual items for 30% off. 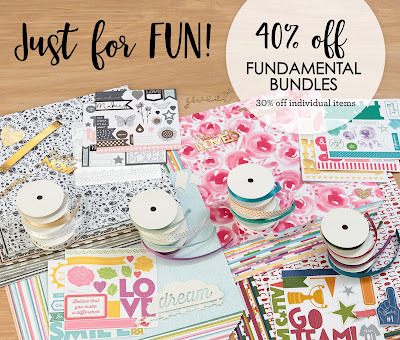 Fundamentals are exactly what they sound like...the foundation for building cards and scrapbook pages. 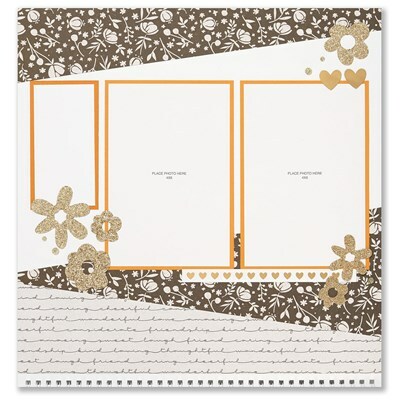 Pair them with each other, other packs, and even stretch your holiday or seasonally themed papers. If you host a party that reaches $350, you'll receive one Fundamental Bundle for FREE in addition to your regular hostess gifts. That's over $80 in FREE product plus your half-price item which includes the Workspace Wonder. 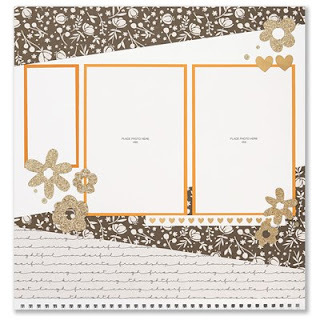 This bundle of organization only comes as a hostess gift and normally retails for $128.50. 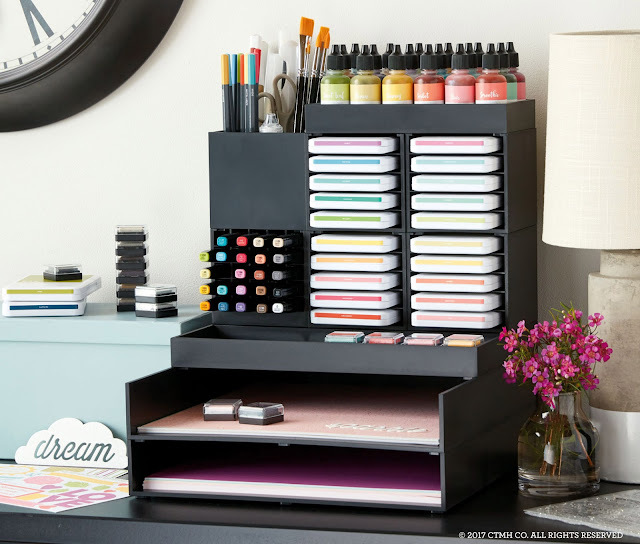 If you add the $64.25 savings on this organization system to your $80+ in FREE hostess gifts, you're getting around $150 in products for only $64.25 (plus S&H and applicable tax). On top of that is this month's Stamp of the Month. It retails for $17.95, but is only $5 with a $50 order. This stamp set features every month of the year plus some fun icons. For a full picture of the set, check out the top photo on my sidebar. In December, CTMH will be running a calendar special which includes this stamp set; however, you won't get the $5 option. 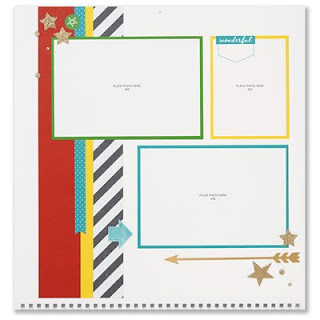 You will be able to purchase the calendar kit with or without the stamp set, but the option that includes the stamps will be priced much higher than the option without. In other words, get it this month or wish you had next month. So much goodness. Click here to start shopping (and remember you have less than 7 weeks before Christmas)! Head over to my recently redesigned author website for your chance to win BIG! 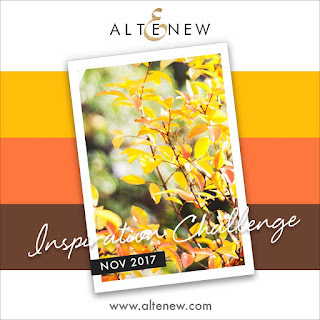 This week the challenge at Heart2Heart is Vines and Twine. I went literal with a vine wreath and Thick Twine bow. The wreath is from a retired set called White Pines. I white embossed it over water color paper and then started painting. Here's a close-up to show you a bit more of the water coloring. I wanted there to be enough color behind the wreath for it to show up but also be soft enough to blend into the rest of the background. In order to make that work, I started by painting green mixed with brown all around the wreath. I then dotted higher concentrations of the green and brown in various spots. I dabbed excess color off with a clean paper towel and then let it dry. Once water colors are set, you can layer over the top of them without washing them out. Next I flicked brown, green, and blue over the whole panel, dabbed where it was too dark, and again let it dry. The next layer was a light wash of blue. Before it dried, I flicked more green, brown, and blue wherever I wanted more. And then some more dabbing with the paper towel until I was happy. Before adding the white enamel dots and Fern Twine, I stamped the sentiment from Falling for You-Cardmaking in Fern Ink then ran it through a rectangular stitched die from My Favorite Things. I used Liquid Glass to attach the twine bow and shape the tails. The last step was to add foam tape over the back of the water color panel and mount it over a Kraft card base. I've been on a bit of a water coloring kick this past week. It's such a beautiful medium and doesn't require a great deal of skill. 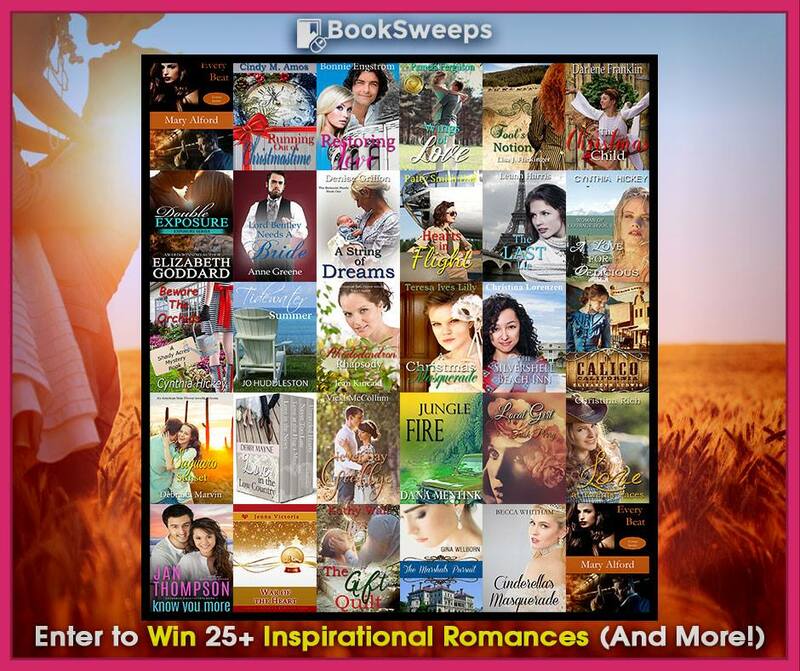 I hope you'll join us at Heart2Heart this week and show us your best interpretation of the vines and twine theme. The Hardly Workin' card on the right started with a wash of colors. I began by painting clear water in a square. I added some yellow, ochre, and green letting them fade together as they dried--which was the hardest part of this entire card. I'm not patient about allowing things to dry on their own, but there's a softness to the blend of colors that's only achieved by leaving them to dry naturally. 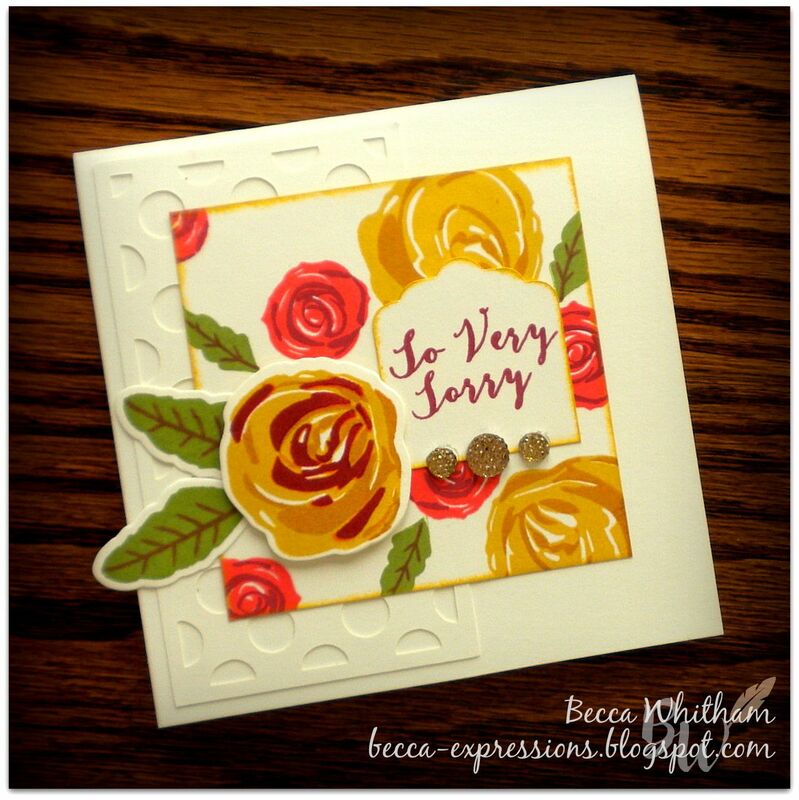 I gold embossed the flower from the Kind Thoughts Workshop Your Way and added a sentiment from a long-retired set. I then ran my entire watercolor panel through a rectangular stitched die from My Favorite things and mounted it over a card base covered by striped paper from the Enchantment Fundamentals paper pack. The Workin' Hard card started with white embossed images from the same Kind Thoughts WYW over watercolor paper. I painted the various flowers, let them dry, then fussy-cut them out and mounted them to a card panel I'd run through another MFT die and hand-trimmed for the stitched and curvy bottom edge. After the flowers were mounted, I flicked watercolor paint in both peach and green over top of everything. I added some sequins with Liquid Glass and glued the panel to a card base with a bottom border of the same paper from the Enchantment Fundamentals paper pack. I'm entering this card into "The Card Concept: Autumn Love" challenge. The other thing I've been workin' hard at this month is updating my author web page: www.beccawhitham.com. I've begun a subscriber newsletter and will be giving away these two cards as part of a promotion. 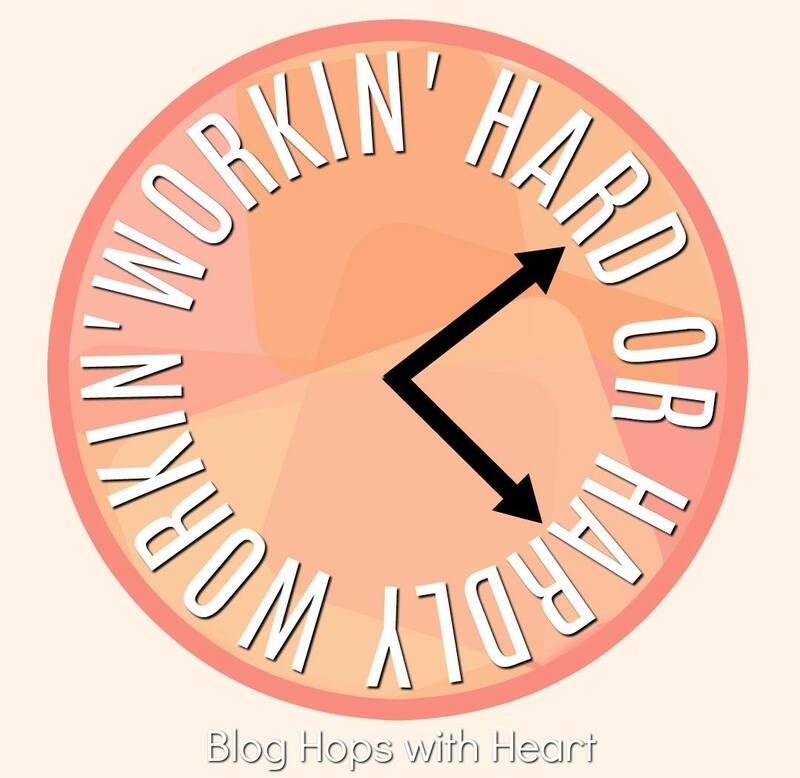 Please head over there and sign up (I promise not to flood your inbox or sell your info) before moving to the next hop which is Jayma's blog. You should have come from Stephanie's blog. My parents are arriving later tonight. We'll be seeing the sights and (hopefully) enjoying pleasant sunny days and crisp October nights. Fall is my favorite season and it's been late coming to my corner of the map. The weather turned this last week, so I plan to celebrate with the annual baking of Pumpkin Chocolate Chip muffins. YUM! My Stronger Together stamp set arrived yesterday. It was just in time...unfortunately. I paired it with a long-retired stamp set to create a card for a friend with a family member facing ovarian cancer. Teal is the color for ovarian cancer, so I used Peacock ink. To get the two-tone look, I added the color onto the ribbon with Sponge Daubers. These tools are a must in my opinion. I went heavier in the center and the part that goes behind the top loop of the ribbon. So easy to do and so effective. Once the ribbon was stamped, I used the sentiment from Stronger Together over top in Black ink. The background paper is from Enchantment Fundamentals. I cut it to 3.75 x 5" and glued it to a card base. The top panel measures 2.5 x 3.75". Once all the layers were down, I hand drew the squiggly white lines with a gel pen. To date, the Stronger Together campaign has raised over $40,000 for the Red Cross. This year has been devastating. I hope you'll join me in helping spread a little love to our neighbors all around by purchasing this wonderful stamp set. I've embedded links for all the currently available supplies used on this card, but here's the Stronger Together link again. Fall is in the air...or at least it's supposed to be. Here in South Carolina, it's 90 degrees and humid. I guess that's why I couldn't quite go with fall colors on my sister-in-law's birthday card . However, gluing the strip of paper back to the left side of the card was the last thing I did, so just hold on while I finish describing the process. After I had "never stop creating" line done, I glued the piece of card front I'd trimmed off back on the left side of the card base and trimmed off the excess to bring it back to a 4.25 x 5.5 card. The final touch was to tie a White Twine bow around the right side flap and secure it with some Liquid Glass. My sister-in-law is an artist who hasn't had much time to create while holding down a full-time job. She retired in January and then spent the next six months fighting cancer. She appears to have beaten it (halleluiah, amen!) so I wanted to challenge her to get back to painting. Everyone should do more of what makes them happy! This week at Heart2Heart our theme is Be-YOU-tiful. I chose to use the Beautiful You stamp set for this watercolored card. The stamp set comes with multi-layered images. I clear embossed the middle layer of all three floral images over watercolor cardstock. Then I painted with red, yellow, purple, and blue allowing each color to dry before adding the next. I embossed the sentiment with white embossing powder over vellum paper. 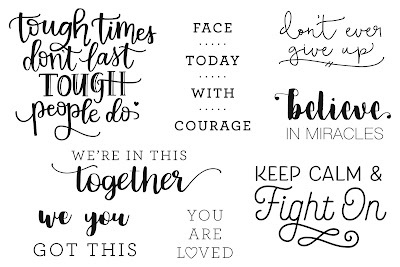 There are a few ways to select only the letters you want from a sentiment. I chose to ink carefully just the parts I wanted and then brush away excess powder from whatever I didn't want. I hand trimmed my vellum into a banner, folding the excess over the top of the 4 x 5.25 watercolored base. To secure the vellum, I sewed with a zig-zag stitch and pulled the top thread through to the backside of the paper before using a copious amount of foam tape to secure to the card base. This is a relatively simple card, although it's somewhat time-consuming in execution just because you need to let the water coloring dry. I'm no expert at water colors, but I do know that the trick to controlling where the color goes is to "paint" with clear water first, add the color, and then leave it alone to dry. It was my birthday on Saturday. My husband took me to a plantation near Charleston, SC with the oldest formal gardens in the US. It was a wonderful few days of unplugging and letting go of my deadlines and his class projects. Here's my favorite picture of our trip. It's the Mill at Middleton Place as seen through the branches of an oak tree dripping with Spanish Moss. I hope you all are enjoying Columbus Day, and all of us at Heart2Heart look forward to seeing your creations this week.